Mark Melanson (17 points) clinches the Burlington win with two free throws with 2.9 seconds left in front of a stunned Salem student section. Mark Melanson bothers Dario Medrano on his late layup attempt. (Salem) Mark Melanson came up huge in the last twenty-six seconds and led Burlington (#12 seed) past the host Salem Witches (#5 seed), 69-64, in the first round of the Division 2 North. This was a game in which neither team passed a chance to launch from long range. I counted sixty-one 3-point attempts! The crowd saw a fast-paced game with the final outcome uncertain until late in the last minute. 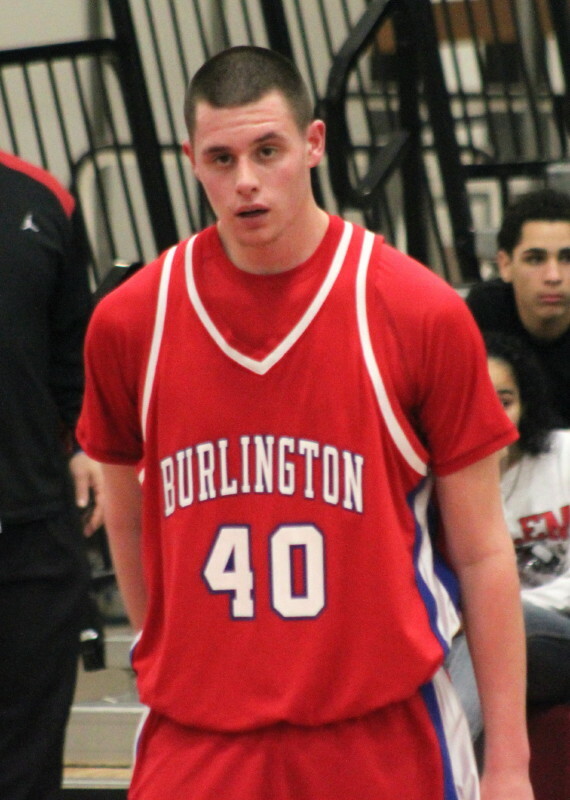 Burlington’s Ryan Putney got into the lane for a game-tying (64-64) layup with twenty-six seconds left. After a Salem timeout, Mark Melanson came up with three crucial plays. (1) When Salem broke through Burlington pressure, Dario Medrano went in for a go-ahead, layup attempt. Mark was close by (note the picture) and harassed Dario into a miss without fouling. (2) Going the other way against Salem pressure, Burlington broke through and Mark was located by Ryan Putney in the corner in front of the Burlington bench. 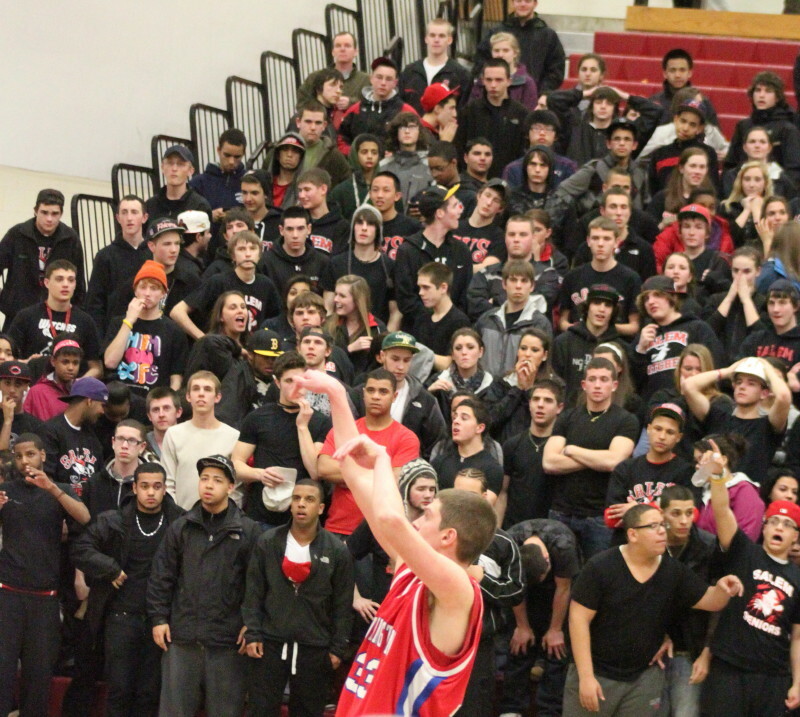 He drilled a three from there to give the Red Devils a 67-64 lead with nine seconds left. Antonio Reyes sets for a late-game three with Connor Gallivan (#3) defending. (3) After an Antonio Reyes attempt to tie, Mark grabbed the rebound, got fouled, and drained two free throws in front of a stunned Salem crowd to seal the win with 2.9 seconds left. Salem (15-6) came into the final two minutes of the game with a 2-point (64-62) lead but came up empty on five straight possessions. You kept waiting for a three to drop for them but they had nothing to show for nine tries in the last quarter. One mystery I solved before the game related to Zach Hurynowicz. Zach reached 1000 points for the Devils this season. He was a preseason 3rd team player according to ESPN. He had a remarkable 48 point game in January against Woburn. He was averaging close to 20 points per game. He was also sitting on the bench in a recent game with no explanation for the reason in the article including that information. I’m thinking injury and I’m wondering how serious. I pick up a program as I enter the Salem gymnasium and Zach isn’t even on the roster. Now I’m really wondering. 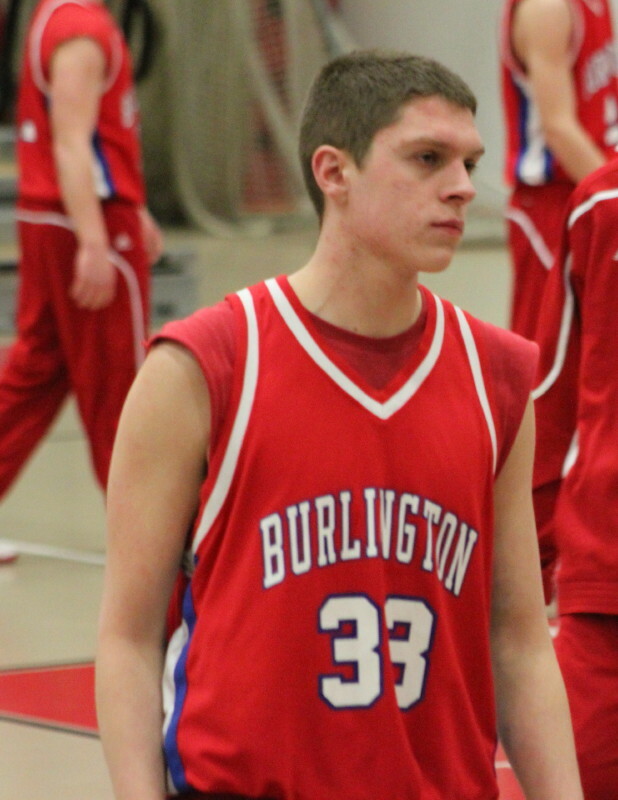 I find someone with a Burlington athletic jacket on and get the full scoop – Zach is off the team because of grades. Minus Zach, I liked Salem chances. Sometimes, however, when a key player is missing, others step up. And that’s what happened with Burlington. After Salem jumped off to a quick 6-3 lead on two Antonio Reyes 3’s, the Devils cranked up their defense (Salem had one basket in their next sixteen possessions) while on offense Burlington went on an 16-2 run. 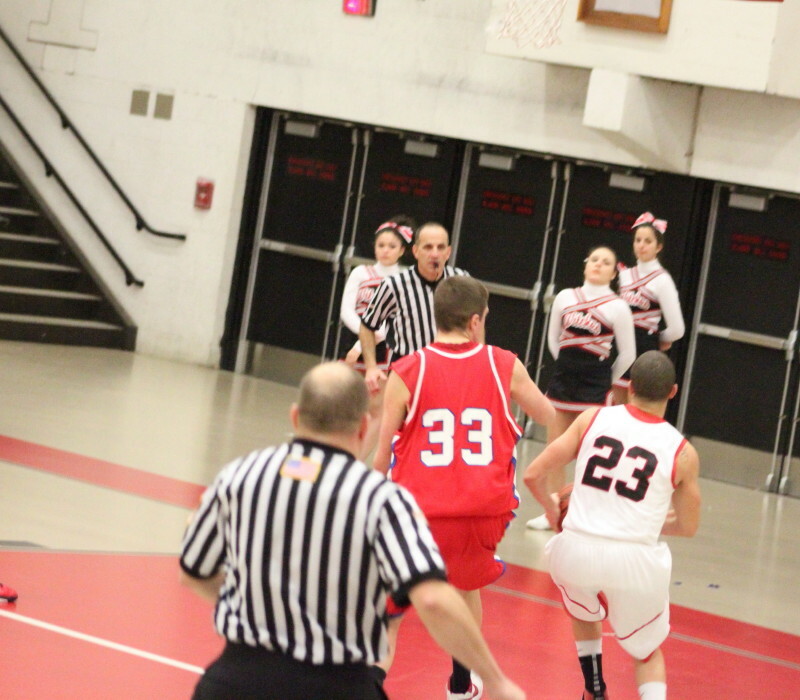 Mark Melanson had two 3’s and Greg Sheridan had one as part of this run. Burlington led 18-10 after a quarter. Raphy Medrano (21 points) launches a three over Ryan Putney (#23). In the second quarter, Raphy Medrano got so hot (made four 3’s) that I thought I’d see the fire marshal at any moment! 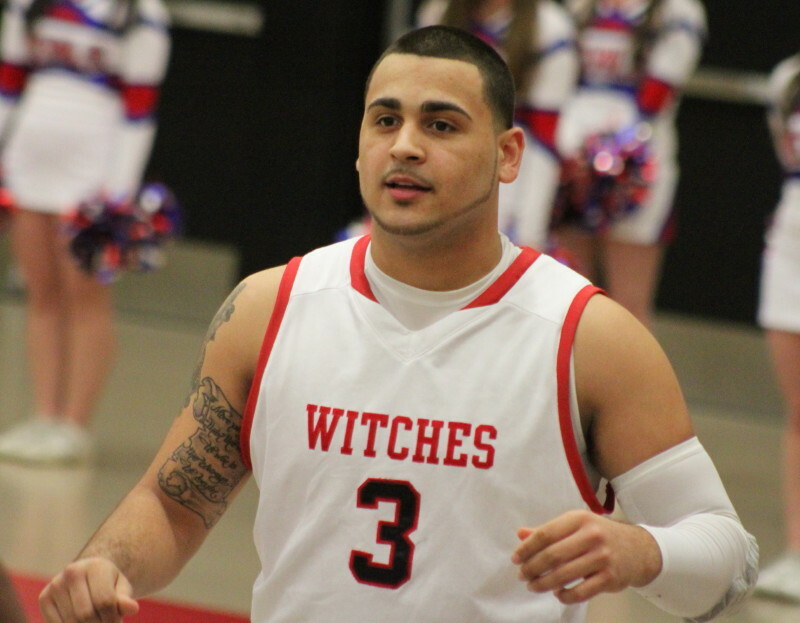 Raphy was key in twelve straight Salem points and the Witches went up, 28-23, with 4 ½ minutes left in the quarter. Salem had a one-point (34-33) lead at the half. I suspected at halftime that three-point shots would be crucial the rest of the way. Having seen Salem twice, I figured that they were the likely team to cash in the most from long range. I sure got that wrong! 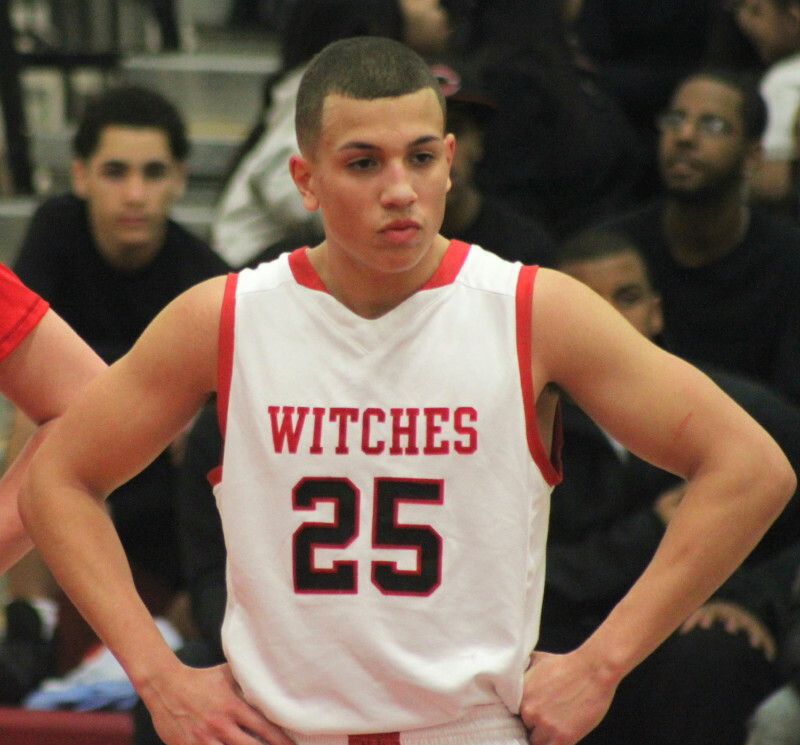 The Witches were 3-for-17 in the second half while Burlington was a sizzling 6-for-11. The Devils put together 2 ½ minutes of unanswered offense (nine straight) and pulled away, 53-47, with a minute left in the third quarter. 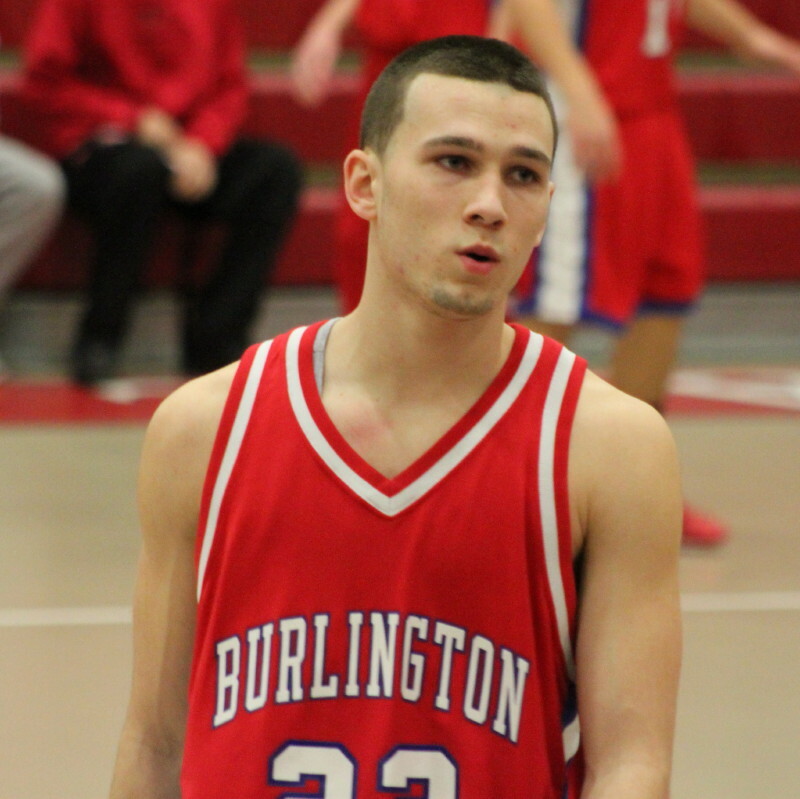 Burlington got inside for three layups (Joe Renaud, Ryan Putney, Shane Farley) and also had a three from Shane. 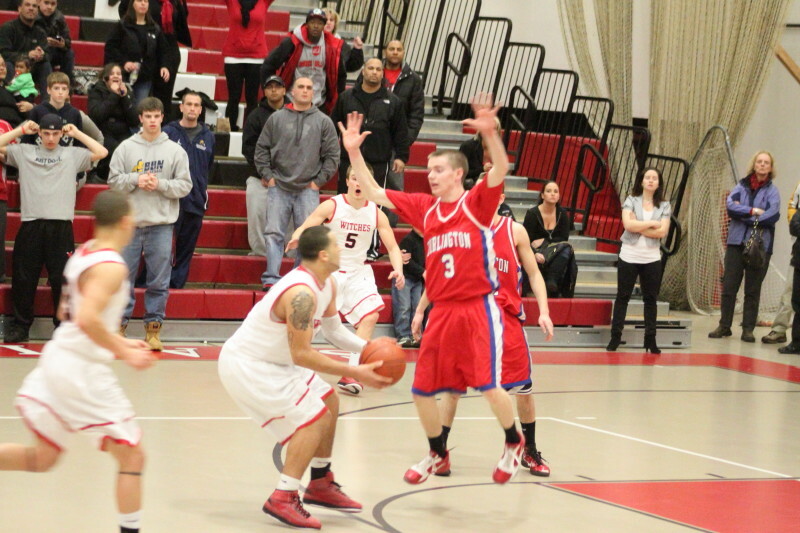 A last-second three (Dario Medrano) narrowed Burlington’s lead at the end of the third quarter to, 53-50. Salem put together a 12-2 spurt early in the final quarter and went up by four (62-58) with 4 ½ minutes left. A key play there was a steal by Antonio Reyes that he turned into a layup down the other end. Chants of “MVP, MVP” rang out from the Salem student section after that play. The Devils got inside twice to Joe Renaud to tie the score before Antonio Reyes and Ryan Putney traded baskets. This set the stage for the final twenty-six seconds and the Mark Melanson heroics. Raphy Medrano (21 points) led all scorers. He made five 3’s. 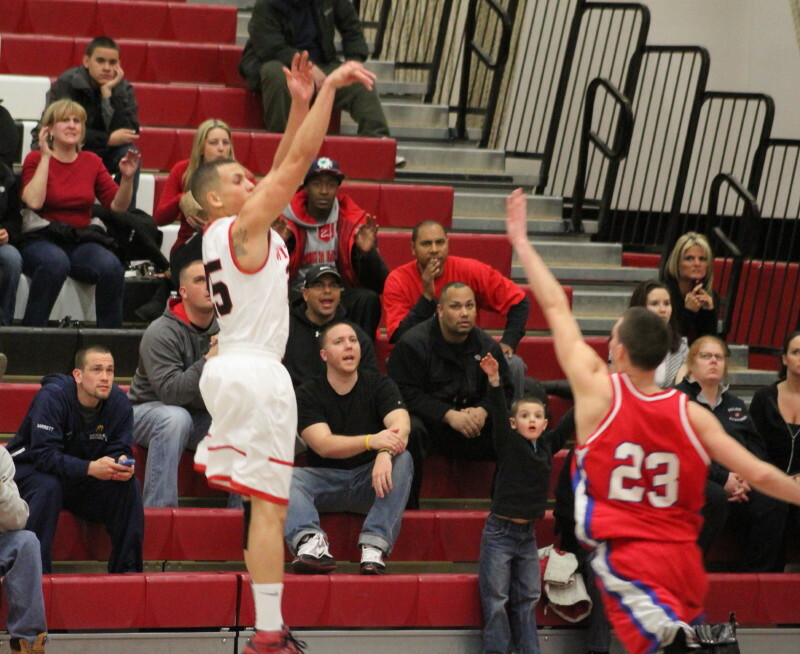 Mark Melanson (17 points) also had five 3’s. Antonio Reyes – One of the North Shore’s best over the last three seasons. Antonio Reyes (15 points) hit his first two shots from long distance and never made another one the rest of the way. I suspect that many of the Salem faithful were as surprised as I was by that. 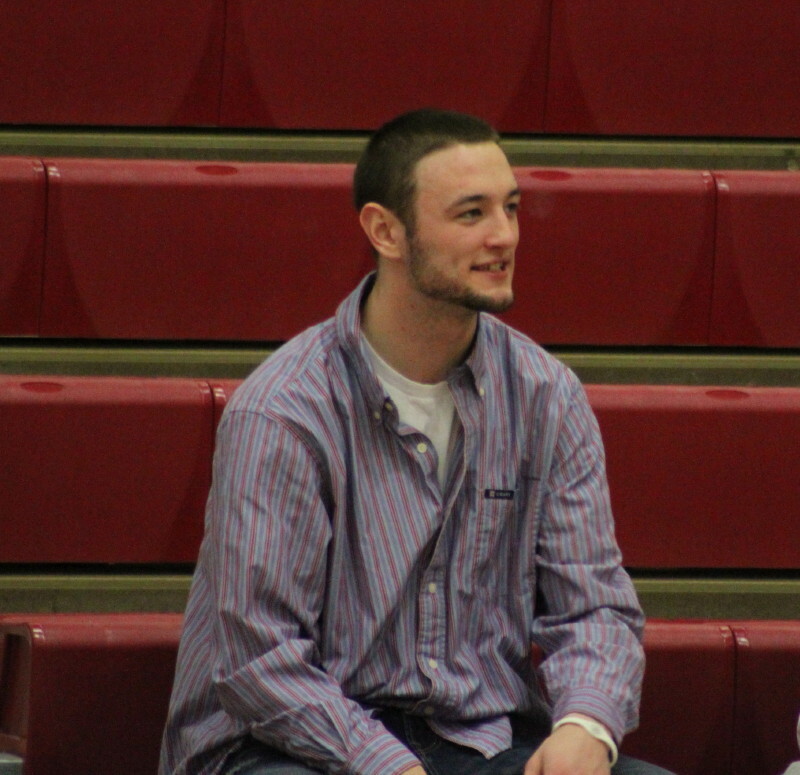 Ryan Putney (13 points) was isolated late and got into the lane for the tying layup in the last minute. The sudden end for Salem was a surprise after they won the Division 2 North last year. They are also graduating Antonio Reyes, Brad Skeffington, and the Medranos. The Witches, out of the Northeastern Conference (North), ended up losing five of their last six games. I have watched Antonio Reyes play for three seasons. With the body of a linebacker (his position on the Salem football team) and a sizable collection of moves and shots, he was a special player. Burlington (13-8) gets to continue their season against the winner of the Marblehead/Boston Latin Academy game.